For people named Criton or Crito, see Criton (disambiguation). Crito (/ˈkraɪtoʊ/ KRY-toh or /ˈkriːtoʊ/ KREE-toh; Ancient Greek: Κρίτων [krítɔːn]) is a dialogue by the ancient Greek philosopher Plato. It depicts a conversation between Socrates and his wealthy friend Crito regarding justice (δικαιοσύνη), injustice (ἀδικία), and the appropriate response to injustice. Socrates thinks that injustice may not be answered with injustice, and refuses Crito's offer to finance his escape from prison. This dialogue contains an ancient statement of the social contract theory of government. The dialogue begins with Socrates waking up to the presence of Crito in his prison cell and inquires whether it is early in the day. Crito informs Socrates that it is indeed early and that he, Crito, chose to let Socrates sleep in peace, especially given Socrates' current distressful circumstance of awaiting his own execution. Crito explains that he admires the peaceful manner in which Socrates has heretofore lived and the level of calm that Socrates displays in the face of death. Socrates replies that it is only fitting that he react in such a manner given his age and expresses surprise that the guard has let Crito into his cell at such an early hour. Crito informs Socrates that he is well-acquainted with the guard and has done him a certain benefaction. Crito relays bad news to Socrates. He tells him that there are eyewitness reports that the ship has come in from Delos, and that tomorrow Socrates will be executed. Socrates rebuffs the report, saying he has had a dream - a vision of a woman in a white cloak telling him that on the third day hence he will go to Phthia, which is a reference to Achilles' threat in the Iliad that he—the mightiest of Greek warriors—might just leave for his home in "fertile" Phthia and be there in "just three days" if the Greeks fail to show him due respect. Socrates says that the meaning of this is perfectly clear - it will be three days until he dies. Many of the details of Plato's Crito have also been included in the modern play Socrates on Trial: A play based on Aristophanes' Clouds and Plato's Apology, Crito, and Phaedo, adapted for modern performance. ↑ Andrew David Irvine. ' Apology, Crito, and Phaedo, adapted for modern performance (Toronto: University of Toronto Press, 2008). Allen, R.E. (1980). Socrates and Legal Obligation. Minneapolis: University of Minnesota. Brickhouse, Thomas C.; Smith, Nicholas D. (2002). The Trial and Execution of Socrates: Sources and Controversies. New York: Oxford University. Colaiaco, James A. (2001). Socrates Against Athens. New York: Routledge. Kamtekar, Rachana, ed. (2005). Plato's Euthyphro, Apology, and Crito. New York: Rowman & Littlefield. Kraut, Richard (1984). Socrates and the State. Princeton, New Jersey: Princeton University. McNeal, Richard A. (1992). Law and Rhetoric in the Crito. New York: Peter Lang. Stokes, Michael C. (2005). Dialectic in Action: An Examination of Plato's Crito. Swansea: Classical Press of Wales. Stone, I.F. (1988). The Trial of Socrates. New York: Little, Brown. Weiss, Roslyn (1998). 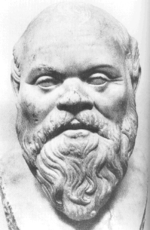 Socrates Dissatisfied: An Analysis of Plato's Crito. New York: Oxford University. Woozley, A.D. (1979). Law and Obedience: The Arguments of Plato's Crito. London: Duckworth.